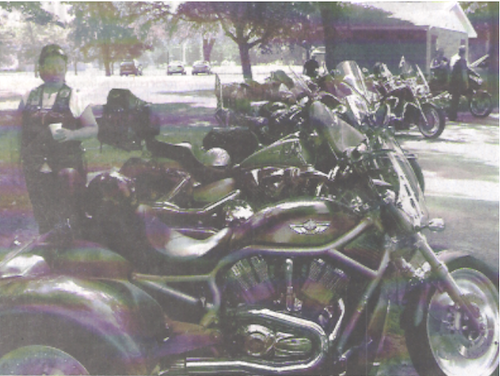 On August 15, 2009, the Warriors of the Light, Christian Motorcyclists Association, Chapter 580, of Mt. Pleasant Michigan, held a Motorcycle Benefit Ride to raise money in support of Joshua’s House, a Maternity Home, that is raising funds in support of purchasing a facility to have the home in. The ride began in Shamrock Park in Clare. There were 29 motorcycles and 44 total participants in this event. The ride was approximately70 miles and toured through parts of Clare, Isabella, Midland and Gladwin Counties, ending back in Shamrock Park in Clare, where there was food for all participants. Door prize tickets were drawn as the crowd ate and prizes were awarded to all in attendance. Donations of items came from the following area business and individuals: Fran Sizemore (from West Branch chapter - doilies), Steve's Country Market, Harrison, Central Motor Sports, Mt. Pleasant, Lil' Chef Restaurant, Mt. Pleasant, Express Lube, Clare, Heritage Automall, Mt. Pleasant, Shaheens, Mt. Pleasant, Ponderosa, Mt. Pleasant, Clare Big Boy, Clare, American Cleaners, Clare, Coffee Talk 505, Clare, Hungry Howies, Clare, Buccilli's Pizza, Clare, Dagwoods Auto Repair Clare, Crankers, Mt. Pleasant, Meijer's, Mt. Pleasant, Glen's Market, Clare, Kroger Store, Mt. Pleasant, Divine Power and Crank, Shepherd, Gordon Food Service, Mt. Pleasant, Kay & Jim LaMay, DuCharme’s Country Store, Farwell. The amount raised from this event was just slightly over $700.00 and was presented to Joshua’s House President Renee Jeffords by the Warriors of the Light Chapter President Donna LaMay. Our thanks to one and all that helped and participated in this event, we hope to make this an annual Benefit Ride for the on going expenses of Joshua’s House.